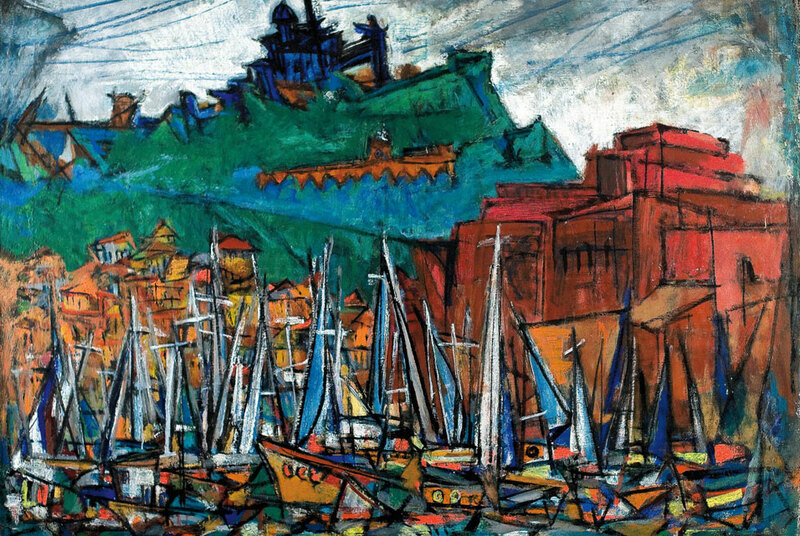 Marcel Janco (1895 - 1984), Marina, 1930. Oil on canvas, 135x100 cm. Signed (lower right) and dated (lower left). Estimate: £100,000-150,000. Photo: Bonhams. LONDON.- A work by Marcel Janco, the Rumanian-born artist, one of the founders of the Dadaist (anti-artists) movement, and a contemporary of Pablo Picasso, is the top lot in Bonhams Israeli Art & Judaica in London on May 24th. The painting titled `Marseille Port, 1933, an oil on canvas, 100 x 133cm (39 3/8 x 52 3/8in), is estimated to sell for £120,000-180,000. Born in Romania in 1895, Janko was among the principal founders of the Dada Movement which was opposed to war, aggression and the changing world culture. Dadaist events included poetry, avant-garde music, and mask wearing dancers in elaborate shows, teasing and enraged the audience through the defiance of Western culture and art, which they considered obsolete in view of the carnage of World War I.
Janco has an eclectic style which brilliantly combines abstract and figurative elements, expressionistic in nature. In 1941 he moved to the land, which was to become the nation of Israel in 1948. Here he painted idyllic watercolour and oil images and was captivated by the exotic sights of the Orient. In 1953 Janco established the artists village known as Ein Hod, which now boasts the Janco Dada Museum. In 1967 he was awarded the Israel Prize for Painting. In the last years of his life he worked together with friends to erect the Janco Dada Museum, dying just ten months after the inauguration of the museum in 1984. Another Israeli artistic luminary, Israel Hershberg, is also featured in this sale. Hershberg was born on November 7, 1948 in a Displaced Persons camp in Linz, Austria. In 1949, he emigrated to Israel and lived there until he was nine. In 1958, he immigrated to the United States where he attended the Brooklyn Museum School, Brooklyn, New York from 1966 to 1968. Israel Hershberg moved back to Israel with his wife and family in 1984. In 1991, he was awarded the Sandberg Prize for Israel Art and in 1998 the Tel Aviv Museum of Art Prize for Israel Art. The artist is the founder and director of the Jerusalem Studio School, and lives and works in Jerusalem, Israel. 66 x 78cm (26 x 30 11/16in). 101 x 153cm (39 3/4 x 60 1/4in). 73 x 60cm (28 3/4 x 23 5/8in).